A new kind of media brand, for a new kind of media environment. In the spring of 2015 I was hired by Hearst/SNAP to create a new media brand for Snapchat's Discover platform. I built a team of writers, editors, designers, producers, and photo and video editors and set about defining the brand's editorial mission, aesthetic, and tone of voice. The above is a teaser video we made shortly after we went live, featuring all-original content. Rather than retrofit our content to Discover, we created original stories, videos, and photo shoots with the spirit and energy of the platform in mind. Every day, we published a new edition which introduced our insatiable, global audience to the people, places, and things that made life more interesting, covering both emerging and established talent. From the beginning, Sweet was designed to be unisex, and specialized in emerging trends with an emphasis on fashion, entertainment, music, beauty, art, technology, and culture. Our motto was simple: Love Something New Every Day. Bringing extremely high editorial standards to Discover, we focused on quality and originality and quickly found an engaged, excited audience for our content. Everything was original, and everything was produced with our audience, and the unique vertical platform in mind. At Sweet, we employed a team of motion graphics designers and illustrators to create original art daily. The result was beautiful illustrations that elevated the brand, and platform. 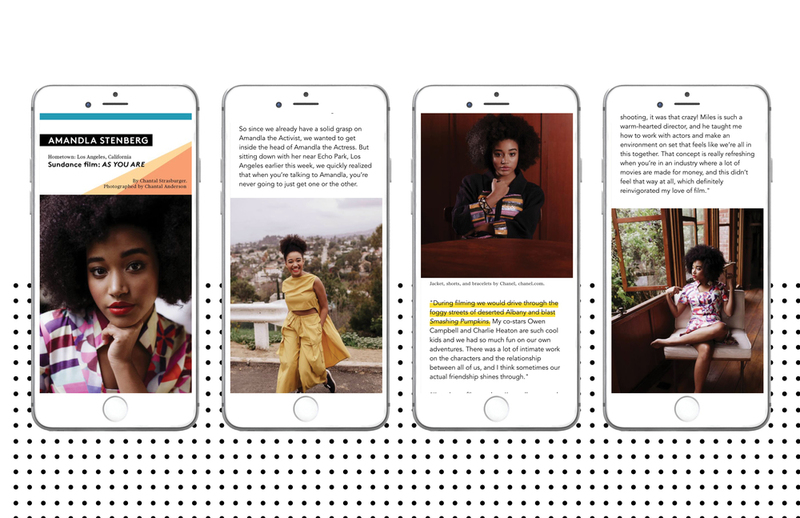 Each new edition of Sweet featured stuff you needed to know about from the cutting edge of fashion, beauty, music, entertainment, culture, travel, food, and more. Here's a look at some of our favorite stuff. From buzzed-about debut novelists such as Stephanie Danler (Sweetbitter) to Booker Prize winners (Marlon James), cultural icons (Carrie Brownstein), and legends such as William Boyd and Mary Gaitskill, Sweet was a revolving door of literary talent, who came in to read exclusively from their novels, and sometimes even to bring us cakes (thanks again, Adam Johnson!). At Sweet, we were always seeking out the best design in the world. From the coolest coasters in Copenhagen to a look inside the studio of an exciting Brooklyn ceramicist, every day featured groundbreaking design to buy, emulate (we often featured How To videos), and inspire. One of our most popular design features was a recurring franchise called “The Edit,” for which we asked the owners of our favorite design stores to curate exclusive lists of items just for us. Music was a key part of Sweet, and we regularly featured live music sessions, filmed exclusively for us in New York and London, where the BBC Radio 1 DJ Huw Stephens hosted a weekly Sweet Session. We featured exclusive performances from artists including Alessia Cara, Ellie Golding, Tinashe, Connor Youngblood, and Christine & the Queens. Fashion was an original pillar of Sweet, with a focus on a high-low mix, price points which were both aspirational and affordable, and curating the very best market pieces. We regularly created original fashion shoots with both talent and models, and worked with designers including Carolina Herrera to debut both collaborations and entire collections with talent including actresses Amandla Stenberg and Kiernan Shipka. Whether we were taking an exclusive tour of a luxury enclave in upstate in New York, at home with a model-designer couple in Sydney, or premiering a furniture collection from a new designer, Sweet was always getting inside people’s homes, providing access to places you don’t usually get to see, and providing a constant stream of beautiful things to fill your space with. Sweet’s editors were a peripatetic bunch, and we also relied on a global network of freelancers who contributed stories from every corner of the globe. Never content to just take second-hand stories, we strived to be where the action was, on the ground and passing along these first-hand experiences to our audiences, often in real time via our organic Snapchat account and other social media as well as on Discover. Created to celebrate the 100th anniversary of the National Parks Service, this huge edition embodied many of Sweet’s core values: adventure, exploration, discovery, and inspiring travel. Highlights included a moving essay by the acclaimed writer Terry Tempest Williams about the iconic Ahwahnee Hotel, and a recipe for making the very best trail mix ever. An edition published on the first day of the film festival that featured an exclusive portfolio of the most exciting talent at Sundance, from actors including Amandla Stenberg and Mary Elizabeth Winstead, to writers, directors, and a look back at the best films to ever premiere there. In response to an advertiser request, Sweet created five original editions around the July 4th holiday, with a focus on America. I sent the team to five American cities—Santa Fe, San Luis Obispo, Portland, Louisville, and Charleston—where we produced editions that touched on Sweet’s core pillars while providing an in-depth and unexpected look at the cities. In Portland: delicious doughnuts and mixology so complex it bordered on science. The design of Sweet was clean, unisex, modern, utilitarian, and whimsical (when we wanted it to be). We had a graphic system in place featuring franchises and system icons which, along with crisp typography, let the tone of voice shine through. Four main colours and two typefaces ensured content was quickly recognizable and shareable.